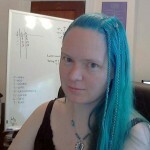 Carolyn VanEseltine is an accomplished game designer and developer, having worked at such studios as Harmonix and Giant Spacekat. Her recent presentation at Google, "Everyone can make games now", underscores her belief that the freedom to make games is a basic human right, and that games should open and accessible to all as a medium of artistic expression. But what does it mean to be a game designer? Does one need to know how to program, or is that the province of game developers? Do the interactive fiction made possible by game engines such as Twine and Inform qualify as games? What basic skills should a participant in the upcoming Global Game Jam or Ludum Dare events have? In this podcast interview, Carolyn and Ken discuss these topics and more.